This page contains four examples of how to use rather simple techniques to encode data. Each of the techniques relies on a character-by-character encoding. Consequently, none of them are useful for anything but trivial use. In addition, two (#2 and #3) rely on Excel specific capability. For all but the first example, the data are assumed to be organized as follows. 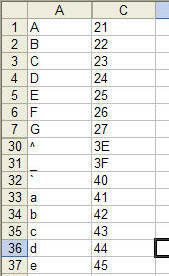 Column A of the active worksheet lists the character to be encoded. Column C lists the corresponding code to use as a 2 character hex code. The string being encoded is in E1. The first three functions are used in an Excel worksheet as shown in Figure 2. The last function is demonstrated in Figure 3. The function KeyToHex simply converts the string in E1 into its hex equivalent. This technique leverages the fact that Excel VBA can use certain Excel functions. Since the mapping information is in two ranges, the code uses the INDEX and MATCH functions to lookup the the code values corresponding to each character. MatchingCodes is a Mx1 range. SecretCodeCI = "Error: " & Err.Description & " (" & Err.Number & ")"
Since the lookup functions in Excel (MATCH, VLOOKUP, etc.) are case insensitive, the code below uses the one Excel function that is case sensitive -- FIND -- to search a string. Obviously, that requires that the mapping information be converted to a string. The code uses the Excel TRANSPOSE and the VBA 6 Join functions to accomplish that. Note that a variant that combines a component of the previous technique would be for the code to use the result of the FIND to index into the MatchingCodes range as above. That would lift the restriction that each cell in MatchingCodes strictly contain a two character hex code. SecretCode = "Error: " & Err.Description & " (" & Err.Number & ")"
This technique bends Excel's rules of how a function is supposed to work. The SetupLookupMap function actually initializes a global table that is used by the FastLookup function for the actual lookup. To ensure that Excel calls the LookupMap function both when the string to be encoded changes and when the encoding map changes, the encoding map is passed to the function in the 2nd and 3rd arguments; however, the LookupVals function really uses only first argument. This set of functions is used as shown below.